A top price of 20,000gn was met with a round of applause at the Aberdeen-Angus sale in Stirling yesterday. The price, which proved to be the top for the day, was set against sticky bidding as farmers kept a tight hold on their purse strings. Despite that the sale average was up £72 to £4,544 for 32 sold, which Aberdeen-Angus Cattle Society chief executive Johnny Mackey said was “very positive” given the uncertainty in the market. Achieving the sale topper was the senior champion from the pre-sale show on Sunday – January-2014 born Haughton Levi from Peter Whittaker at Whittaker Farms in Northumberland. This one is by Hallington Evo and out of Haughton Laura, which stood female champion at the Highland Show in 2014 and is out of a cow – Lockerley Laura – which has bred sons to 24,000gn. Levi was shown by stockman Fraser Cormac and marks the best price ever achieved by the Whittaker family. He heads to the Old Glenort herd of James Porter in Northern Ireland. The next best price of 7,000gn was achieved twice – first for the pre-sale show champion and then for the overall reserve. Both beasts hail from Neil and Graeme Massie’s Blelack herd at Dinnet, near Aboyne. 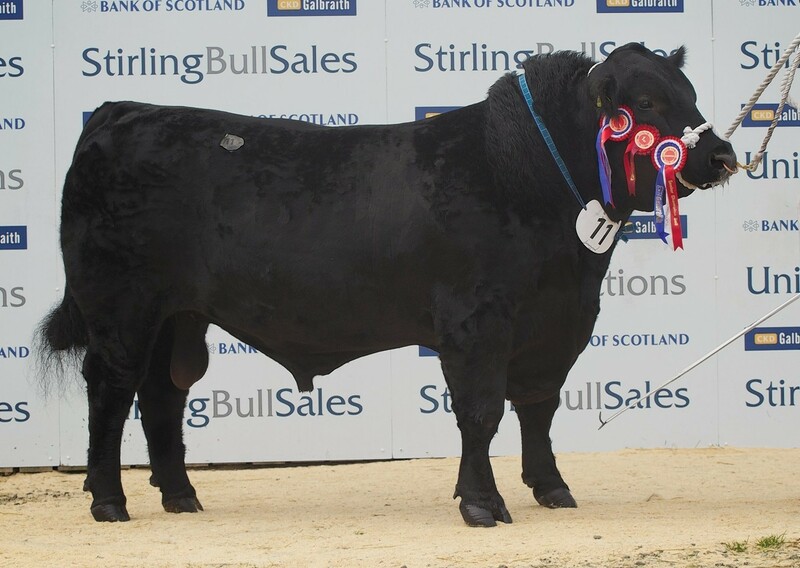 The overall show champion – April-2014 born Blelack Bluey – sold to David Walker, Galcantray Farm, Cawdor, Nairn. This one is a home-bred son of Blelack Evergreat, who is a full brother to bulls at 25,000gn and 19,000gn, and out of Blelack Bluebird. Meanwhile, the reserve overall champion – April-2014 born Blelack Everest – was snapped up by Carskiey Partners at Carskiey Estate, Campbelltown, Argyll. This one is home-bred out of Blelack Evora and by Blelack Equity whose mother – Blelack Eyrie – sold for 32,000gn and holds the record price for an Aberbeen-Angus cow. Next best at 6,000gn was a first-prize winning intermediate bull from the trustees of the late Gordon R Brooke, Farm Office, Upper Huntlywood Farm, Earlston. Linton Gilbertines Drago is a March-2014 born son of Rawburn Black Hawk and out of Linton Gilbertines Dame Gisela. He was bought by UM & RJ Venner, Woodington, Witheridge, Tiverton, Devon. Thereafter another from the same herd sold for 5,500gn. Linton Gilbertines Bold Ruler is an April-2014 born son of Rawburn Black Hawk and out of Linton Gilbertines Brittany. He heads to Mark Haistead at Meadow Brook Farm, Braymeadow Lane, Little Melton, Norwich. The highlights of the day, apart from the 20,000gns bull, came later in the day with the total herd sale of the Weeton herd belonging to John and Doreen Loftus, Preese Hall, Preston. The distinction between a total herd sale and a dispersal is that with the former the vendor retains the herd prefix. He saw some good prices yesterday with a best of 18,000gn for the eight-year-old cow Blelack Eyrie, a 32,000gn breed record purchase at the Blelack reduction sale in 2012. Her first calf Blelack Equity has bred well and been flushed frequently. She was sold to Messrs McLusker, Co Down with a June-born heifer calf by Netherallan Peter Pershore at foot with another two heifers from the same flush sold for 5,000gn each to Garner and Newton, a third at 7,000gn to Hugh Hodge, Glensochie, Stanley and a fourth at 5,800gn. Another Blelack Eyrie and Netherallan Peter Pershore daughter – the 2013 born Weeton Eyrie N376 – was knocked down for 15,000gn to Richard and Carol Rettie, Aberdona Mains, Alloa. The heifer was sold AI’d to Retties Lone Ranger. A cow and bull calf combination, sold separately grossed 27,000gn. The cow, the three-year-old Weeton Diamond Mist, by GH Coverboy Eric, was knocked down for 13,000gn to Redhead and Watson, Bowsden Moor, Berwick-on-Tweed. Her bull calf, the December-2014 born Weeton Diamond Mine by Weeton Lord Heath then sold for 14,000gn to Hamish Sclater, Denhead Farms, Turriff. Weeton Miss Essence, Nightingale Defiance daughter made 10,000gn knocked down to Donald Rankin, Kilmalaug, Portree. Mr Rankin also purchased the heifer calf Weeton Lady Heather for 8,000gn. The sale of Tom Rennie’s Mosstonmuir herd saw the four-year-old cow Mosston Muir Ingrid L289 sold for 11,000gn to Graham Willox, Meikle Pitinnan, Oldmeldrum. Her nine-month-old heifer calf Mosston Muir Ingrid R151, by Mosston Muir Mr Angus, then sold for 7,000gn, also to Mr Willox. John Elliot, Roxburgh Mains, Kelso parted with the 30-month-old in-calf heifer Rawburn Ebony, by Oakchurch Field Marshall, for 10,000gn going to John Walsh, Buckingham.